Keep returning for the latest news on this anniversary of the Islamic Revolution. The New Republic is live-blogging news of events in Iran today, on the eve of 22 Bahman (February 11), the anniversary of Iran’s 1979 revolution. The Iranian opposition movement is slated to co-opt the state's annual rallies to stage another mass demonstration--the largest since December's violent protests on the Shiite holy day of Ashura. February 11, 2010, 6:41 pm. We wrap up today's coverage with Washington's reaction to Ahmadinejad's declaration that Iran is now a "nuclear state." The Associated Press reports that White House spokesman Robert Gibbs dismissed Iran's claims during a press conference Thursday afternoon, saying that Iran's leadership "has made a series of statements based on politics, not physics." "Quite frankly, what Ahmadinejad says, he says many things and many of them turn out to be untrue. We do not believe they have the capability to enrich to the degree to which they say they are enriching," Gibbs said. Gibbs's dismissal of Ahmadinejad's anniversary speech comes just one day after a decision by the U.S. Treasury Department to impose new sanctions against the Islamic Republic, freezing the assets in U.S. jurisdiction of a Revolutionary Guard general and four subsidiaries of a construction firm he runs, reports AP. February 11, 2010, 6:35 pm. We interviewed two Iran experts who offered us their takes on today's anniversary rallies in Iran—on the disappointing turnout for the Iranian opposition, and the apparent success of the government. U.S.-based Ali Mousavi-Khoeini, who was a member of the Iranian parliament, or Majlis, during the reformist presidency of Mohammad Khatami, called 22 Bahman’s unexpectedly low turnout a “wake-up call” for the opposition. “The regime’s thorough clampdown on the opposition in the preceding weeks certainly took its toll on today’s turnout. But the primary reason behind the disappointing ‘green’ presence stems from a lack of organization,” Mousavi-Khoeini said in a phone interview. The former parliamentarian said the opposition’s "leadership" figures--which he says include both Iran-based figures such as Mir Hossein Mousavi, Mehdi Karroubi, and Mohammad Khatami, and ex-government figures based outside Iran--largely operate in isolation from one another. “Today’s events taught us that these leaders need to work together more cohesively in order to plan strategically for the future of the [opposition] movement,” says Mousavi-Khoeini. 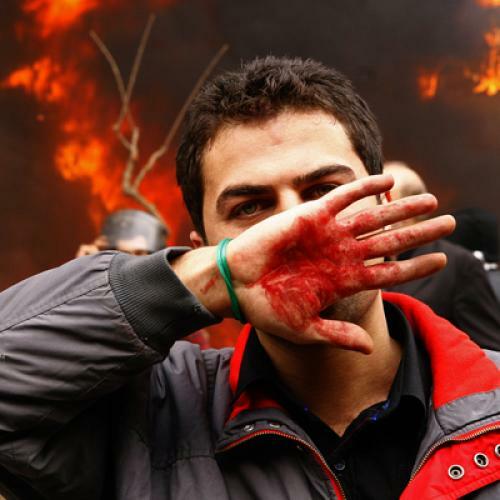 "I think simply counting how many heads are on the streets is a misleading barometer of Iranian public opinion. We [don't] have the full picture just yet, because Internet access has been impeded for many. Information is still trickling out," says Carnegie's Karim Sadjadpour. "It was perhaps a tactical mistake by opposition supporters to build expectations too high for this day. [But] I am confident that if people were allowed to freely assemble, there would be crowds upward of five million people in Tehran, and millions more in places like Isfahan, Shiraz, Mashad, and Tabriz," Sadjadpour adds. “That’s a good starting point for 22 Bahman," Lucas contends. "If the regime prevailed today, it did so in part because expectations of the opposition had been set so high." February 11, 2010, 3:09 pm. The mood in Tehran appeared to be more subdued late Thursday night. Witnesses in north and central Tehran told us that tonight there were no chants of "Allahu Akbar." As we reported Wednesday, the use of "Allahu Akbar" as a statement of dissent is a tactic that was widely used in the run-up to the 1979 revolution. The collective cry is now meant to boost morale for the next day's turnout by opposition supporters, and reaffirm support for the opposition the evening after a demonstration has taken place. Residents initially took to their balconies and rooftops to voice their protest against the contested June 12 elections, and have continued to do the same both before and after every major protest that has taken place since. The fact there have been virtually no "Allahu Akbar" chants this Thursday night can therefore be considered an anomaly—and another sign that today was a disappointing one for the opposition. February 11, 2010, 2:28 pm. Iran's supreme leader Ayatollah Ali Khamenei released a statement late Thursday in which he thanked “tens of millions” of Iranians for participating in the country's 22 Bahman rallies, according to the Iranian Student News Agency (ISNA) website. February 11, 2010, 1:59 pm. Witness accounts are starting to trickle in, with one person who attended Thursday's rallies reporting that security was so tight during today's anniversary march that it was nearly impossible to walk in even small-sized groups. “It seemed that security forces were closing in around us the whole time. They woudn't allow people to form even groups of 10. And only the government-sanctioned supporters could get anywhere near Azadi [Square],” the witness said. “Some plainclothes and riot police suddenly poured around my daughter and when I ran in front of her to protect her and began pulling her away, they beat me instead with batons,” said one 67-year old witness who had attended the rallies with his 30-year old daughter and 25-year old son. “We weren't even shouting slogans; they just suddenly attacked her. They can tell who looks like a government supporter and who doesn't,” said the witness. "This day is supposed to be for everyone to attend. We weren't even shouting anything, but they beat us." Another eyewitness present at the demonstrations and reached by telephone gave us his thoughts on 22 Bahman's weak protester turnout. "The Greens made a strategic error today. Everyone I've spoken to is crestfallen and say that we missed a major opportunity," the 31-year-old male said. God is Greater! You will fall! The caption reads "Morning of 22 Bahman" and depicts two green-clad protesters on their way to the demonstrations. The older man marching in front is carrying a religious work and rosary beads, while hiding "green" paraphernalia etched with harsh anti-government slogans. The girl explains to the boy, "Granddad plans to get into Azadi using the Trojan horse method." "Millions of Iranians across the country have taken to the streets to celebrate the 31st anniversary of the victory of the Islamic Revolution. … In the capital Tehran, an extraordinarily high number of people from all walks of life marched across the city and gathered at Azadi (Freedom) Square to take part in the festivities. They were carrying banners denouncing the enemies of the country. … A few hundred of supporters of Iran’s defeated presidential candidates also rallied in Tehran." Press TV's website is still down, ostensibly as a result of the internet lockdown, at 9:00 pm Tehran time. February 11, 2010, 12:41 pm. Cleric Mehdi Karroubi's son, Hossein Karroubi, told PBS Frontline's Tehran Bureau in an interview Thursday that before attending today's march, Iranian intelligence services had warned the opposition leader in a letter that he would be the target of a suicide attack and shouldn’t participate in the march. Mehdi Karroubi, who was attacked during today's march, was hit with pepper spray and is being treated for "burns to his face and eyes" and for "trouble with his lungs," said his son. "Plainclothes agents approached him and kept spraying it in his eyes. He’s resting at home though; he’s not been hospitalized," Hossein Karroubi said, adding that there is still no news of his brother Ali Karroubi, who has reportedly been arrested (see our below report from 12:13 pm). We haven’t been able to figure out where he is. We believe he’s in the custody of the law enforcement agency," he said. February 11, 2010, 12:33 pm. Opposition leader Mir Hossein Mousavi, whose presence at the demonstrations was eagerly anticipated by the opposition, tried to march with a crowd of opposition supporters on Azadi Street Thursday morning, but was surrounded by special forces and plainclothes agents who prevented him from doing so, reports the opposition figure's Kalameh news website. Kalameh made it a point to add that Mousavi, who was prime minister of Iran when former supreme leader Ayatollah Ruhollah Khomeini was in power, had been attending 22 Bahman anniversary marches every year for the past 30 years. February 11, 2010, 12:13 pm. What has happened to the major opposition figures and their families today? The state Iran Labor News Agency (ILNA) reported Thursday that former President Ali Akbar Hashemi Rafsanjani attended the anniversary rally without any security issues. Meanwhile, opposition websites said plainclothes security forces and police attacked the cars of former president Mohammad Khatami and cleric Mehdi Karroubi as they rode along Sadeghiyeh Square, which is around two miles away from Azadi Square, where President Mahmoud Ahmadinejad gave his speech marking the anniversary of Iran's 1979 Revolution. Zahra Rahnavard, the wife of opposition figure Mir Hossein Mousavi, was attacked on Thursday by plainclothes agents who punched and beat her with batons while she was attempting to march in the demonstrations near Sadeghiyeh square in western Tehran, Rahesabz reported. Security forces briefly detained Khatami's brother Mohammad Reza Khatami and his brother’s wife, Zahra Eshraghi, who is the granddaughter of Ayatollah Ruhollah Khomeini, the founder of the Islamic Republic. Opposition figure Mehdi Karroubi's son, Ali Karroubi, has been arrested, reports Enduring America correspondent Josh Shahryar reports on his blog. February 11, 2010, 11:48am. It appears that while clashes between security forces and opposition supporters were heavy--with security forces armed with riot gear, tear gas, and batons and reports of gun shots fired in the air--they were not high in number. Turnout so far is still unclear, but is reportedly around tens of thousands for the number of government supporters and perhaps a few thousand for the opposition. The opposition website Rahesabz reported scattered clashes at Sadeghiyeh Square in western Tehran, where opposition leader Mehdi Karroubi announced he would begin his march to Azadi (Freedom) Square at around 10 am. February 11, 2010, 11:02 am. An informed source in Tehran told us that foreign media journalists covering the 22 Bahman event were bused in to Azadi Square, the site of the official state rally in central Tehran, early Thursday morning. Foreign media reporters have been formally banned by Iranian authorities from attending non-state sanctioned rallies and street demonstrations since mid-June. Rather than issuing a direct ban on coverage, the Cultural Ministry invited reporters to cover Ahmadinejad’s speech. “They told us this is the program for today,” says the informed source, adding that reporters were barred from leaving the event and were bused out at the end. "By the time I hit the streets (in the early afternoon), it was pretty quiet in general. We've been hearing about smaller flare ups, some arrests and beatings, but nothing like anyone expected." “There was extra security ... the Greens either didn't show up or authorities were successful in keeping them out. I think [the government] used all their resources to get people there, but the fact is this was a five-day weekend this year and many people (even from [the government's] side) just decided to get out of town. They also blocked all of the entryways into the area, so it was hard to get in without permission,” the correspondent said. February 11, 2010, 10:20 am. Amidst clashes between government security forces and opposition supporters in the Iranian capital, President Mahmoud Ahmadinejad on Thursday declared the Islamic Republic “a nuclear state” and said the country is now able to enrich uranium to over 80 percent purity. "When we say that we don't build nuclear bombs, it means that we won't do that because we don't believe in having it," he said. "The Iranian nation is brave enough that if one day we wanted to build nuclear bombs we would announce it publicly without being afraid of you. "Right now in Natanz [enrichment complex] we have the capability to enrich to more than 20 percent and to more than 80 percent, but because we don't need to, we won't do so,” he added. February 11, 2010 9:08 am. Security has been tight, with Rooz staff in Tehran reporting that, since early Wednesday morning, black armored cars belonging to the Revolutionary Guards, the country's elite security force, were seen circling the main streets of the capital. It is rumored that "plainclothes agents" have also been stationed along the demonstration routes. A little before 2 am Thursday morning (roughly 10:30 am in Tehran), Enduring America reported that trucks equipped with loudspeakers were roaming the streets of Tehran blaring pro-government slogans. Up to around 3 am Eastern Standard Time (EST), the websites of Iran's state IRIB broadcaster, Press TV English-language news channel, official IRNA news agency and semi-official Fars news agency are all down. It appears that the internet slow-down has affected the state media as well. February 10, 2010, 6:04 pm We were able to find only two videos of tonight's "Allahu Akbar" chants. Usually there are easily a dozen, and typically more, videos posted on YouTube. One well-known Iranian blogger now living outside of Iran said in a Skype interview that the lack of information is "very disheartening" and could indicate a major decline in the flow of information tomorrow compared with previous protest days. "Based on the trend of blocking messengers and emails in the last couple days, I'm afraid that on 22 Bahman the internet might go into total lockdown," the blogger said. February 10, 2010, 5:56 pm Shouts of "Allahu Akbar" (God is Great) reverberated throughout the Iranian capital late Wednesday night, as residents took to their balconies and rooftops to voice their protest as Iranians did during the aftermath of the contested June 12 elections and on the eve of every major protest since. The current use of "Allahu Akbar" as a statement of dissent is a tactic that was widely used in the run-up to the 1979 revolution. Now, the collective cry is meant to boost morale for the next day's turnout by opposition supporters. “What people fear most in coming out to the streets is the escalation of naked violence that [government security forces] have been using,” the activist adds. Meanwhile, online activists have been circulating downloadable leaflets for on-the-ground distribution to promote turnout. Since last June's contested elections, the Iranian cybersphere has been replete with posters and other graphic material with various "green" messages. This recent poster, for example, urges Iranian viewers to refrain from watching Islamic Republic of Iran Broadcasting (IRIB) television. February 10, 2010, 4:18 pm. Taking a cue from their opposition counterparts back in Iran, diaspora activists in France on Tuesday night reportedly spray-painted the slogans “Where is my vote?" and "Down with the dictator" on the outside walls of Iran's embassy in Paris using green paint. February 10, 2010, 3:40 pm. Mousavi, for his part, declared last week in a forceful interview posted to his official site Kalame.org, that the revolution had “failed to realize its objectives” and that Shah-era “tyranny” remained: “The muzzling of press and media, our overcrowded prisons and the brutal killing of people in the streets in response to their peaceful demands for their rights demonstrate well the existence of roots of dictatorship and autocracy dating from the monarchical regime." February 10, 2010, 3:36 pm. Iranian state radio and television on Wednesday broadcast footage of Iran' s Expediency Council chief Ali Akbar Hashemi Rafsanjani calling for nationwide participation in Thursday's 22 Bahman rally. “This year is more sensitive than the previous days. The responsible forces and those who are responsible for the security of the rallies as well as people who participate in the rallies should all be careful so that we have a show of unity in our values at least,” he said. February 10, 2010 3:16 pm. Opposition cleric Mehdi Karroubi announced in a statement Wednesday that he will attend tomorrow's rallies, reports Saham News, the official site of Karroubi's National Trust Party. Karroubi called for demonstrators to join him on Thursday to march “calmly and strongly and in silence, just as before, for their lawful and rightful demands,” Saham news reports, citing an official statement from the cleric's office. Karroubi will start marching at 10am (Tehran time) from the Second Sadeghiyeh Square in west Tehran towards Azadi (Freedom) Square, according to the report. “Enemies will have no opportunity for maneuvering and presenting themselves," Police Chief Esmail Ahmadi Moqaddam told the semi-official Fars news agency Wednesday. "The two sides of Azadi Square from North and East (where the protesters always emerge) will be blocked for several kilometers in each direction. Those on these two sides will be diverted away from the eyes of the international press confined to designated areas within the square. At the same time, supporters will be marshaled en masse from the West and South ends of the square … the plan is to fill the space with die-hard supporters while checking the bags and pockets of the others wanting to gain entry to the protected zone to make sure they don't carry any Green paraphernalia." February 10, 2010, 2:02 pm. Iranian authorities have during the last ten or so days intensified a campaign of sweeping arrests that first began on the back of violent anti-government Ashura protests on December 27. Activists and analysts both inside and outside the country say the widespread arrest of opposition activists, students, and journalists in major cities across Iran is part an effort to silence political dissent and preempt any efforts by the opposition to organize protests during government-backed demonstrations marking the Islamic Republic's “22 Bahman” (February 11) revolution anniversary. "Almost all the people that were sending news to me have been arrested and the ones that haven't have gone off the radar,” says Mohammad Sadeghi, a student who manages opposition leader Mir Hossein Mousavi's official Facebook page and heads an Iran-based group of online activists called “Green Revolution” from his home in Germany. “It's been more than a week where almost no one is answering their phones. A few have disappeared and may be in hiding,” he says. A number of activists outside Iran said they fear the recent wave of arrests will make it much more difficult to access news and sources from inside Iran for tomorrow's protests. Some news sources in Mahshad, Tabriz, and Ahwaz have also been arrested, says Sadeghi. Internet service in Tehran on Wednesday has been working “on and off” throughout the day, while gmail access is blocked and can't even be accessed through a proxy server, according to sources in Tehran. “It's been a week that Flash videos have not been working. Usually [the Iranian authorities] get ready 24 hours in advance [of demonstrations], but this time they started preparing one week in advance. The blocking has become more sophisticated,” said one source reached by telephone who works in north-central Tehran. Tara Mahtafar is the Washington correspondent for PBS “Frontline: Tehran Bureau” and a contributor to The Century Foundation’s Inside Iran program. Roshanak Taghavi is an Iranian-American journalist who recently returned from Iran, where she reported for Dow Jones Newswires and The Wall Street Journal.